If you are looking for an impressive performing kit off-road, while still maintaining all of the vehicles safety features on-road this is the kit for you. Pro Comp has successfully tested and passed the FMVSS 126 Electronic Stability Control Test with its new 3.5 Suspension System, proving their ongoing commitment to safety, engineering and technological advancement. The all new 3.5 inch lift for the 2-Door Wrangler JK was designed to provide a great ride on road while easily clearing 35 tires to let you go play off road as well. Includes both front AND rear adjustable chromoly trac bars with heim joints to allow you to center your axle as well as flex without binding. 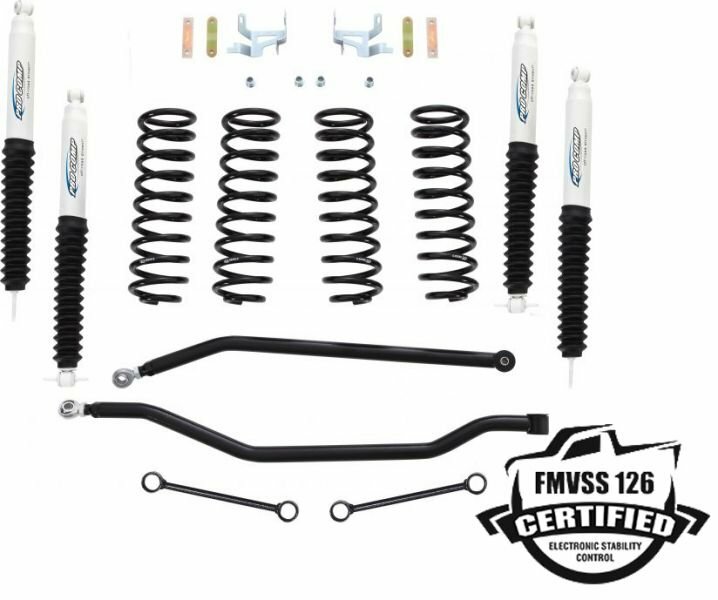 The coil springs are tuned perfectly with Pro Comp's ES9000 shocks and sit tall enough to easily clear those 35 tires. Also included are brake line brackets that fit all JK years 07-14. The FMVSS 126 (Federal Motor Vehicle Safety Standard) is a highly specialized test that determines whether an aftermarket suspension system compromises the performance and effectiveness of the vehicle's Electronic Stability Control System. On March 23rd 2014, at a proving ground in the Arizona desert, Pro Comp successfully tested and passed the FMVSS 126 Electronic Stability Control Test with its 3.5-inch Suspension System on a 2014 Jeep Wrangler. why does the this lift only work on 2 door JK, the video shows it on a 4 door? The four door model utilizes different rate coil springs. The springs on this lift are specifically tuned for a 2 door Wrangler. If you were to put this on a 4 door it would not ride correctly. Please see part number 16085.0422 for the 4 door model.